They’ll receive a new Secret Key and create a new Master Password. They’ll be able to access all the data they had before. They’ll need to sign in again on all their devices once recovery is complete. You can’t recover your own account, so make sure at least two family or team members can recover accounts. That way, if you can’t sign in, someone will be able to help you. You can recover an account for someone at any time. Just keep in mind that they won’t be able to access their account until recovery is complete. Click People in the sidebar. Click the name of a person, then click Manage > Begin Recovery below the person’s name. The person whose account you’re recovering will get an email from 1Password. When they click “Recover my account” in the email, a page will open in their browser. Then they’ll get a new Secret Key and create a new Master Password. If your family or team member can’t unlock 1Password after recovery is completed, they can start over to sign in again. Click the filter to the right of the search field and choose Recovery Pending. Select the checkboxes next to the accounts you want to recover. 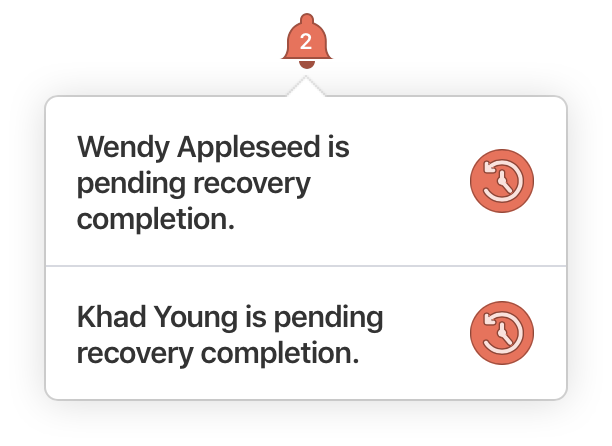 Click Actions and choose Complete Recovery.